Declan McNally, from Ballyronan in County Derry, has been constantly harassed by the police since he was wrongly arrested last July in relation to the killing of PSNI policeman Ronan Kerr. He was among five people arrested in what the PSNI claimed was a “significant” operation although allwere released within 24hours without charge. At the time, Deputy First Minister Martin McGuinness hit out at the PSNI operation saying there were “very serious questions about the conduct of how that inquiry is continuing”. Mr McNally, who is the son of former Sinn Fein councillor Francie McNally, runs McNally’s Inn in Toomebridge, County Antrim. 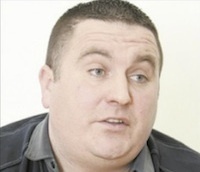 He said thatsince speaking out abouthis arrest he has been relentlessly harassed by the PSNI. But there was a more sinister development last weekwhen he was stopped at a checkpoint shortly after he left his bar. “The first man came to the driver’s window while the second one went to the passenger side of the car,” he said. “He mentioned the police harassment and said he could make it stop, told me he’d make life better for my family. “He shouted ‘We’ll have you done’ and they both ran to the police jeep and drove off. “There were people in cars going past all throughout thisand I would ask anyone who witnessed it to please come forward to me or my solicitor and help me try and put an end to this. The father-of-two is attempting to secure an injunction preventing further approaches. He said he never had “any bother with the police” until he was arrested last year. “Since then though it hasbeen relentless,” he said. However, he said he is now “in genuine fear for his life”.